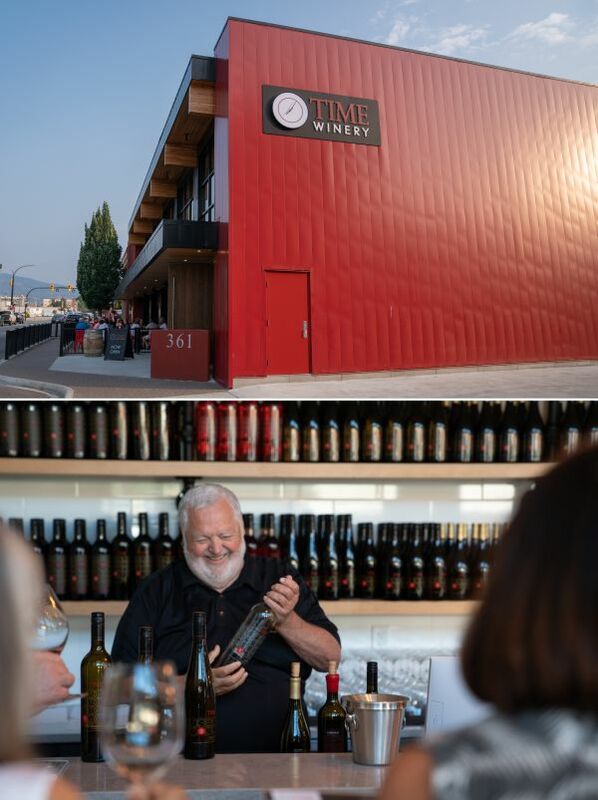 TIME Winery has had some changes over the past year. The biggest is their new winery located in downtown Penticton, where you can taste and buy their wines, but as well enjoy some food at their restaurant. Congratulations to Harry McWatters for opening his new winery and restaurant space. Another new news item that is going to affect this year’s vintage, is hiring Graham Pierce as Director of Winemaking. Prior to joining TIME Winery (and Encore Vineyards), Pierce worked at Black Hills Estate Winery in Oliver, BC for 7 years, and further on at Mt. Boucherie Estate Winery. You should be able to taste some of Graham’s white wines in the summer of 2019 at the winery in Penticton. But for the moment we must get through our rainy and/or snowy winter, and wine is a great helper. I recently received some wines from TIME Winery to taste and tell you about. Here are my notes. Enjoy! TIME Winery Viognier 2017 – This wine is 100% Viognier, with 70% of the grapes fermented in stainless steel tanks and 30% barrel fermented and aged 4 months in new and used French oak barrels. The wine is a bright, medium plus intensity lemon colour in the glass. It has a delightful nose, with aromas of lime and white flowers, with hints of peach and orange. With decanting I picked up some bramble leaf as well. The wine is dry, with a rounder, thicker mouthfeel. It has lower acidity but still leaves some acidic prickle on your tongue. Flavours of tropical fruit, mandarin orange and blackcurrant leaf, along with some oak. I also picked up some steeliness to this wine from the mid-palate to the finish. It has a medium plus length, finishing peppery and a bit hot. You get orange, oak and blackcurrant leaf on the finish. Decanting did not change the wine. Rating: – A very enjoyable lime and white flower nose, followed by tropical fruit on the palate and some pepperiness and blackcurrant leaf on the finish. 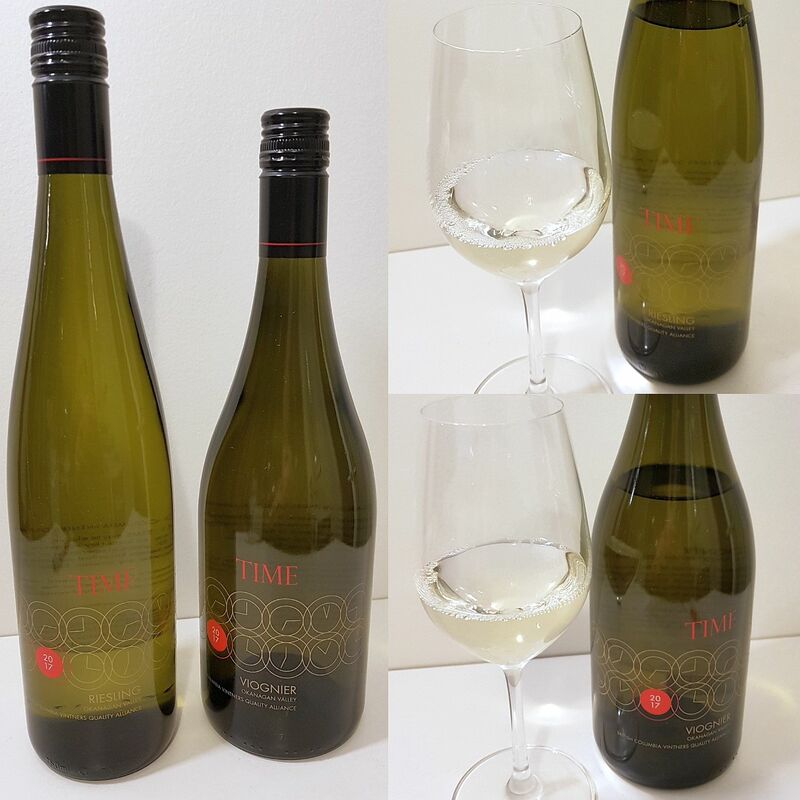 TIME Winery Riesling 2017 – Medium bright lemon in colour. A nice citrus, lime, and stone fruit nose. I did pick up a very faint hint of banana in the background, but that faded with decanting. The wine is medium-dry, with medium body, and a rounder, thicker mouthfeel. It is soft yet has above average acidity. I really noticed a salty minerality to this Riesling. Above average intensity flavours of primarily red apples and pears, with peach behind them. The wine finishes with apple skin and green apple flavours. The semi-sweetness of this wine continues from start to finish, but the above average acidity keeps it in check. With decanting the only thing I noted was some honey flavour on the finish. I think with the acidity level, fruit and sugar content, that this wine has good ageing potential. Taste it now, then taste another bottle in 3-4 years. Rating: Nice red apples and pears with a balance between semi-sweetness and higher acidity. Drink now or cellar for 3-4 years. 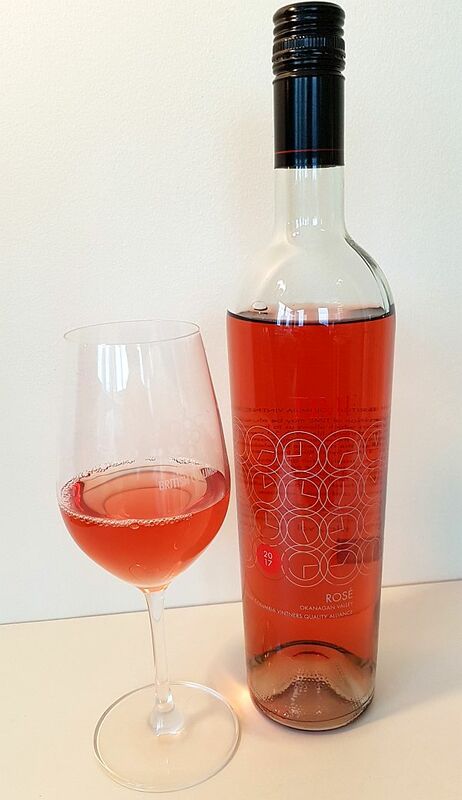 TIME Winery Rosé 2017 – This Rosé wine is made primarily from Syrah grapes (93%) with the remainder from Cabernet Franc. It is a medium intensity orangey red, or possibly light red rhubarb skin in colour. The wine has a medium intensity nose with primarily a rhubarb aroma, with lesser amounts of strawberries and other red fruit. There may also be a hint of cranberry aroma mixed with the rhubarb. The wine is dry, medium bodied with higher acidity and a leaves a light acidic prickle on your tongue. There is some roundness to this wine but the acidic backbone keeps it tart. Tart red fruit fruits, rhubarb, and blackcurrant leaf flavours on the palate. Decanting this wine does not affect either the nose nor the palate. The wine has a medium length, finishing with tart red fruit, rhubarb, and bitter leaf. It finishes a bit peppery, which is a trait of the Syrah grape. Rating: – Quite tart red fruit flavour with a blackcurrant leaf bitterness, and some pepperiness on the finish. 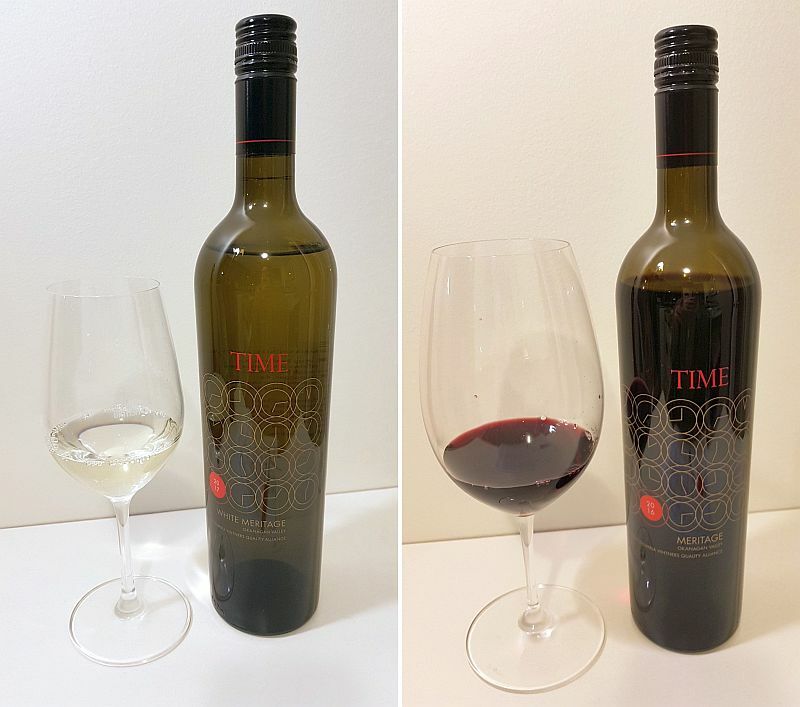 TIME Winery White Meritage 2017 – This wine is a blend of 73% Sauvignon Blanc and 27% Semillon grapes that has been 100% barrel fermented and aged 4 months in new and used French oak barrels. It has a medium intensity bright lemon coloured wine. It has aromas of green fruits, bramble leaf upfront with stone fruits, in particular, peach behind. The wine is dry, round with medium plus mouthfeel. It has medium acidity and is peppery on the palate. Mainly tropical fruit flavours, with lesser amounts of apricots and peaches. I also get apple from mid-palate to the finish. There is some steeliness toward the finish. With decanting there is some oakiness, blackcurrant leaf, and salty minerality on the palate. The wine finishes hot and peppery with tart green fruits. With extended decanting this wine is very enjoyable to drink. You get the fruit flavours, vanilla from the oak barrels, while the hot, pepperiness goes away. I think that this wine may not yet be at its peak for tasting. Cellar this wine for 2-3 years and I think some of the flavours will evolve and will be quite interesting to taste. Rating: A round, peppery wine with green fruits on the nose and tropical fruits on the palate. Buy and hold. TIME Winery Meritage 2016 – This wine is a blend of 65% Merlot, 20% Cabernet Sauvignon, and 15% Cabernet Franc grapes. It is deeply coloured, with a mix of ruby and garnet colours. The wine has a medium intensity, youthful favours, of juicy purple fruits, ripe red fruits, plums, light oak and sweet spices, and with air a hint of capsicum and green stems. The wine is slightly off-dry, with medium acidity and tannins, but medium plus body and flavour intensity. Flavours of red and black fruits, ripe plums, red cherries, with hints of oak, capsicum, cloves, and dark chocolate. I enjoyed tasting this wines as the flavours meandered, with one becoming stronger, then waning, while another flavour became more predominant. The wine is round with a fuller mouthfeel, and a backbone with equal parts of tannins and acidity. With decanting I picked up some perfume and cedar in this wine. The wine finishes with sweet spices, light vanilla, ripe, sweet black fruits, and some pepperiness. Fine tannins. A very good quality wine. It will age nicely. Rating: – A very good quality Meritage. Juicy purple and ripe red fruits on the nose. Smooth, filling mouthfeel. Fine tannins with black and red fruits, and plum flavours, that meander between themselves. Would be excellent with roast beef and with chocolate truffles. You can purchase these wines at VQA wine shops, such as Swirl Wine Stores in Yaletown, but also consider the Save-On-Foods wine sections in Surrey or Tsawwassen. You can also order the wines online from the Time Estate Winery website. Late breaking news from TIME Winery. Penticton’s TIME Winery & Kitchen will be hosting their first Black White & Red New Year’s Party on December 31. Enjoy canapes, oysters and welcome wine while waiting for 2019. And there’s more! Midnight balloon drop, a draw for a magnum of wine and live music by Le Mo Nay will make sure you start the year dancing! Find this event at Encore’s website for $69.99.